Posted on March 22, 2013 by Susan H.
Yes…it can be done. It has taken a bit of ‘creative imagination’ over the years to create an ‘Eggless, Dairyless, Peanut/Tree Nutless Easter’…but such is the life when you have a son with an egg (dairy, sesame, beef, lamb, fish, shellfish, peanut/tree nut, mustard and raspberry) allergy. So you can just imagine my excitement when I discovered ‘Eggnots’ last year…I was giddy as a schoolgirl…even my teenage sons got caught up in my ‘eggnot frenzy’! 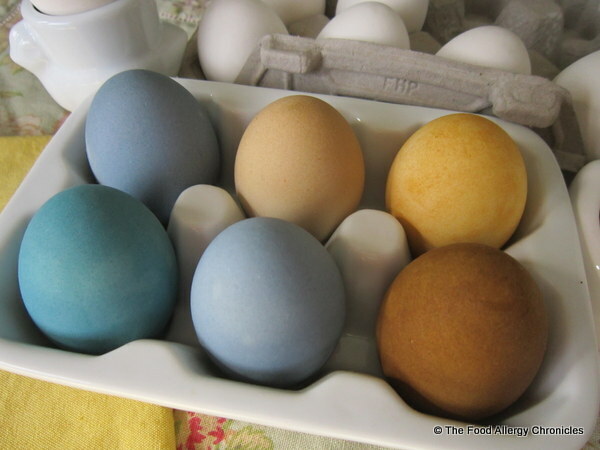 ‘Eggnots’ are dyeable, ceramic ‘eggs’…created by a ‘most awesome Aunt’ whose niece has an egg allergy. Last year my eldest son held an ‘egg’ in his hand for the first time…they really do have the weight and feel of a real egg! Click here for my first post on ‘Eggnots’. As much as I love ‘Eggnots’…I was not a 100% sold on the results of my dyeing with store-bought food colouring…the colouring faded as they dried and seemed a bit patchy. After sending my comments to ‘Eggnots’…they sent me a free dozen for me to try again…this year I decided to try some natural-dyes. ‘Eggnots’ recommends going to Allyson Koerner’s review for natural-dyes…click here. She used natural-dye recipes from Better Homes and Garden…as did I. Click here for their list of natural-dye recipes. I made the cabbage (blue), yellow onion skin (orange), turmeric (yellow), paprika (red/orange) and the grape juice (purple) recipes. 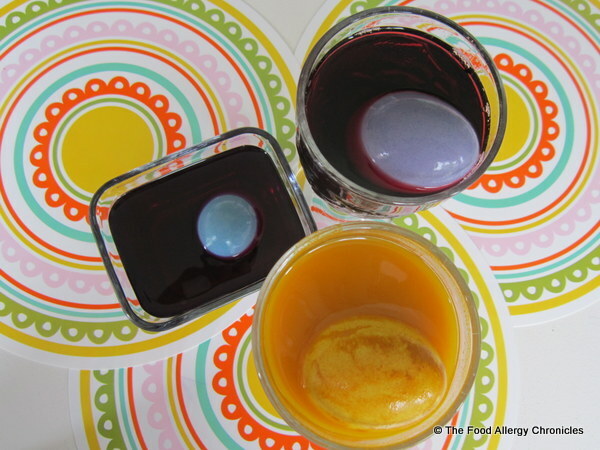 …submerging each ‘eggnot’ in the blue (cabbage) , yellow (turmeric) and purple (grape juice) natural-dyes…needed to use a spoon to hold the ‘eggnot’ under the natural-dyes. I left them for over an hour…wanted to make sure they really got hold of the colour. I then tried the red/orange and the orange…these both needed much more time…I left the red/orange one over night and still the colour was quite pale in comparison to the other natural-dyes. My results…totally impressed with the natural-dyes…just look at the beautiful colours of nature! Love, love, love them!!! From left to right in the front are…blue (red cabbage), purple (grape juice), and brownish orange (yellow onion skins). Back row left to right are…purple (grape juice), light orange (paprika) and mustard yellow (turmeric). Tips: Pat the ‘eggnots’ dry with a paper towel when finished dying…let them sit upright in the paper towel to dry…placing them in an eggcup holder will result in a two-tone colour…which you may or may not be after. 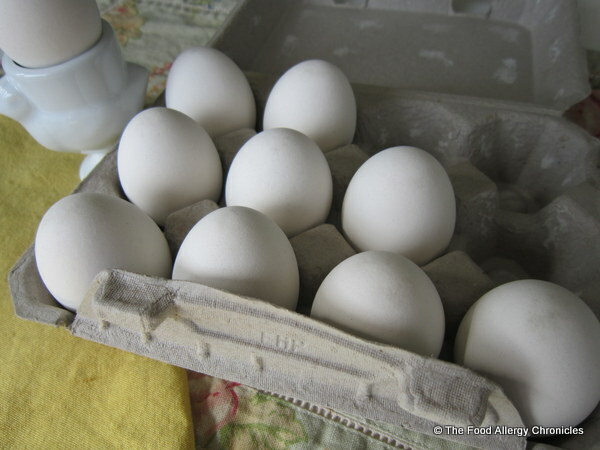 Are you familiar with ‘Eggnots’? If so, what has your experience with dyeing ‘Eggnots”? What is your experience dyeing eggs with natural-dyes? 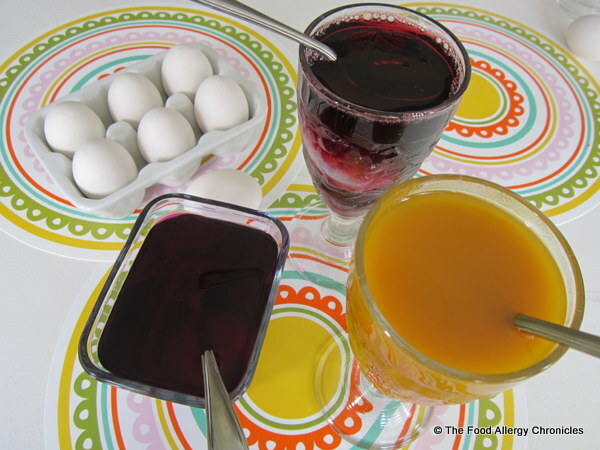 This entry was posted in allergies, Easter, egg free, multiple food allergies and tagged Better Homes and Gardens natural dye recipes, decorating Easter eggs with an egg allergy, dyeing Eggnots with natural dyes, EggNots by Susan H.. Bookmark the permalink. I had never heard of “egg nots”. What a neat idea! I’ll have to get some for next year. Thanks for sharing!! These are really great. And very … rustique looking.